Fukushima Nuclear Power Plant Crisis: What is really the danger? When the MD of TEPCO Mr Akio Komori weeps on National Television, we can no longer escape accepting that the plant is in big trouble. Newly released images and video show clearly a crane that is used to handle spent fuel that is visible from the outside. Based on the normal location of the crane on the edge of the spent fuel pool, the pool, though not visible in the shots, is definitely there, open to the world. When the owner of the fourth largest power company in the world and the largest in Asia breaks down in tears, you know how bad it is. Or you know that he probably wishes the earlier cover ups of security threats at the plants had not been exposed. I am not one to panic. Initially, when I heard about the crisis, I went about supplementing what I remembered reading with information that would reflect happenings and risks without getting into nuclear advocacy or criticism. I shared my findings on not really a risk beyond the evacuation zone. So, from saying that there would be no significant release of radiation, we have gone to explaining that the significant release of radiation isn’t all that big a deal. Because we can no longer pretend that the radiation is not spreading. The West coast of the US and Russia have both registered elevated radiation levels – neither of them dangerous, but they exist and that is enough for people to hit panic levels. Might be good to remember that the Chernobyl explosion, which was definitely worse than this blew radioactive winds across Europe. Europe is thriving, thank you very much. Japan went through Hiroshima and Nagasaki and has better longevity than most places in the world – US included. The cancer rate is far lower for workers in nuclear plants than among general population – go figure! Yes, the plant is devastated, but its hardly flimsy. Look at the destruction it is sitting in the middle of and still is sheltering its precious responsibility with considerable security under the circumstances. That’s not accidental – its design. The rods are in the pool, as we see. The water itself forms a barrier while it keeps the rods cool as well so that the people can work safely, with reasonable precautions. 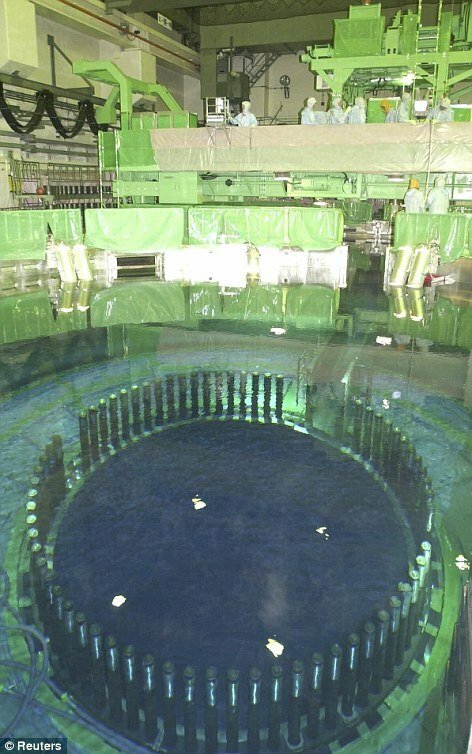 The fuel rods stay ‘hot’ for quite some time post being removed, and it takes several years before they can be considered safe to be packed “dry”. This water is cooled regularly to take away the heat from the decay and the water levels are managed to that the rods are always submerged. What likely happened was that when the cooling systems failed after the earthquake and Tsunami, while the water meant that there was no immediate crisis, it did start heating up. The rods themselves were not all that old out of ‘action’, having been removed about three months ago, so the decay heat, while not the inferno of an active reactor, was still enough to start reducing the water in the fuel tanks. Once the fuel rods got exposed and thus not cooled at all, the heating only picked up pace. The temperature for the zirconium around the uranium pellets to melt is about 1200 deg. Once this starts, we are in the process for a meltdown, and the mass gets increasingly difficult to manage. The zirconium reacts with the water at a high temperature and gets oxidized and releases hydrogen gas (remember the hydrogen related experiments in school?). The thing is that hydrogen is highly reactive, and once vented, combines “violently” with the oxygen in air to form water. Water, of course is not dangerous, but the problem is that the explosion blows the building apart, and the radioactive particles contained in the steam are dangerous. This is actually the good part, because with the fuel rods exposed, they are able to release radioactivity directly into the air. This, described above is the problem at plant 4. 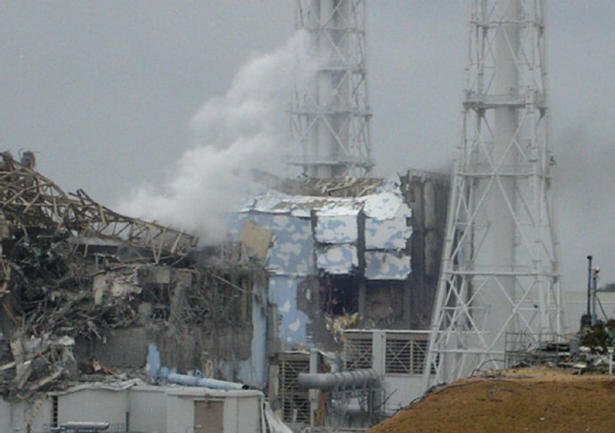 We have had the explosion, the damaged wall only means even less barrier from the radioactive substances, and we see that crane from outside, which is standing next to the spent fuel tanks. Do the math. If there is water, its well on its way to becoming steam. And the biggest problem with this situation is the combination of the limitations of operations due to radioactivity and the number of reactors needing to be pulled back from the ‘edge’. The most dangerous by far are Reactor 3 and 4. Reactor 4 because its wide open to the world, and the only way to cut off that radiation is going to be getting those rods underwater and keeping them there. Reactor 3, because it contains Plutonium, which is really bad news. So tell me again who had the bright idea of recycling nuclear weapons to produce the MOX fuel? Sigh. Its probably a great idea. No one could predict this. Regardless, this stuff is something that would be far more complicated to mop up, so the attempt is to keep it in, where it belongs. There are engineers discussing the possibility of burying the reactors under tons of concrete, a la Chernobyl. However, that is for the future and more to prevent further escape of radiation, and it can be done in Fukushima, but its not much use with our current priority – getting those reactors stone cold. Without that happening, we are risking fission and explosion rather than simple leaks, however radioactive. Also, it isn’t like fission needs oxygen that pouring concrete on it will smother it. It won’t. Plus, the heat from the still hot and heating fuel will mess up the concrete, while the concrete messes the reactor, and only create much more radioactive debris to tidy. The proximity of the reactors is another complication they will have to work around when they do it. I don’t think there is any question of “if” any more. US and UK have advised their citizens to give the area a wide berth – 50 miles. Japan’s zone of course is still 20km, which is not enough, but residents till 30km are being asked to remain indoors, which should protect them too, with precautions. For all the hysteria in the media, there seems to be little actual data to support sustained levels of dangerous radiation. That is not reassuring only because the Government of Japan seems to increasingly become opaque, so we don’t know if its the whole story. The name Chernobyl cropping up constantly doesn’t help either, because one of the main reasons Chernobyl had to be evacuated was the radioactive material that spewed out of the reactor and the vast quantities of radioactive dust from the burning graphite (in other words, radioactive soot). There is no way to clean the ground of each of these gazillions of pieces which will keep emitting radioactivity long after you and I are gone. This is very different from venting a little radioactive steam, or contamination. Even if radioactive material has been leaked, as long as its on the reactor site, and not blown to bits and scattered over entire continents, there is no reason why it can’t be decontaminated later. Yes, the situation is dire, it is critical. But not because it can get to a Chernobyl scale. It is critical, because we are trying to contain damage to a minimum and without electricity, the safeguards built into the reactor are failing. Even if they totally fail, Chernobyl is extremely unlikely. That was a situation where there was no containment at all. There was no precedent, there was far less technology. Japan has a crisis only because it doesn’t want any abandoned zone at all, or, a very tiny one. So far, there doesn’t seem to be any radioactive debris that would make the area unlivable. The danger for the people largely will “switch off” once the fuel is isolated. Radioactive debris on the other hand will send out radiation – mostly contaminating through becoming a part of the place itself – the whole area will have to be isolated. However, and I’m not saying this just to make you feel better, there are many good things happening as well. There is now a good chance that this thing will be under control soon. The idea of the fire trucks spraying water directly on the tanks right through the hole in the wall seems to be working. Surveillance from a helicopter also showed that the tanks were not completely empty. Not that it means anything particularly good right now while the rods stand exposed, but it will mean that much less water to fill in to submerge rods. Electricity has reached the plant from the grid.Power has been restored at the plant, though it will still mean a lot of testing before the cooling systems go online. This is good, because it means that instead of exhausted workers using puny efforts fighting upstream of huge odds, we can engage the pumps and cooling systems that were designed precisely for this job. This will help make the cooling really fast, as well as free up workers from maintaining to recovering damage. What remains to be seen is how far the radioactive contamination spreads before this show comes to a stop. My bet is that if the electricity brings the pumps back online and some of the cooling systems work at least, the rest will be a “recovery without incident”. If not, then its going to be an uphill struggle. With the electricity there, the choices are considerably expanded, but they will still have to be tried and tested. That takes time. But one way or the other, the way ahead is all about getting the fuel underwater, cooled and isolated. In that order. In the meanwhile, while I understand that the Japanese are angry with the government and TEPCO for the risk they are facing, it isn’t the workers putting them at risk. The workers are volunteering their lives away to keep them safe, and they deserve some acknowledgment for what they are doing. I want to criticize some Japanese who have been quoted in news as saying that the workers battling the reactors are just doing their jobs that they are paid for. In saying this, they show how utterly dehumanized their world is. Their words are an embarrassment to them, not to the country, and certainly not to the workers who are fighting death each moment – explosion, accident or radioactivity. I feel quite certain that this arrogant person cannot afford to foot the bill for the things he claims have been paid for. He reminds me of the people shooting at the rescue helicopters after Hurricane Kartina. To end this post, I want to throw in my estimation of what will happen. First, I think that since at least the spraying water from fire engines is working, it will be continued while more robust solutions are searched. Very likely, some electricity powered solution that can be switched on and left alone will happen, at which point everyone can forget about this while it cools down while the employees at the plant get around to fixing leaks and other problems. It will happen within hours if the cooling systems are working when they get electricity, or in another day if something new is brought in. I think the residents in the immediate vicinity may not be allowed to return home, but the remaining will, once the radiation leaks are stopped, and any possibility for recurrence is prevented. Here is to Japan and its spirit to live, to endure, and most of all its incredibly pragmatic attitude. I leave you with a cartoon for Kids to understand what’s up with Fukushima. It is clearer about what is happening than many detailed accounts. Don’t miss this.